Tastes a bit like apple crumble in a glass. The smell of toasting apples and cinnamon that fills the house during preparation is reason enough to make this drink, but it’s also a wonderfully warming tipple, perfect for the festive period. Wassail punch dates back to the Middle Ages and, in the south-west and southeast of England at least, was drunk as part of a ceremony or ritual that took place to ensure a good cider-apple harvest the following year … We’ll drink to that! Preheat oven to 190°C/gasmark 5. Score the apples and place in an ovenprooftray and roast for 45-50 minutes, or until skin is soft and starting to split. 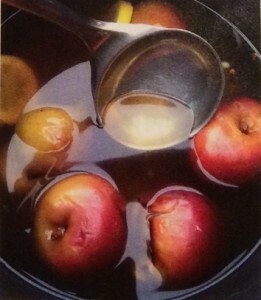 Heat the cider in a saucepan over a low heat and add cloves, cinnamon and nutmeg. Stir well and heat through until the liquid starts to foam. Add the lemon slices and roasted apples, and give the liquid a good stir – if there is any apple juice left in your ovenproof dish, add this, too. If you want to add sugar (We added about 4 tablespoons), now is a good time to do so – add it gradually and taste as you go along. a salutation wishing health to a personespecially when presenting a cup of drink or when drinking to the person. a festivity or revel with drinking of healths. liquor for drinking and wishing health to others on festive occasions, especially spiced ale, as on Christmas Eve and Twelfth-night. Archaic. a song sung in wassailing.